I have been on a Spring Cleaning kick for a couple of weeks. But with 2 kids I have to break big projects into phases because it's just impossible to get everything done at once. Plus, I am spending way too much time on Pinterest and have decided to make some DIY organizers to keep costs down. When I was in high school and college, I was very neat. I had a place for everything and everything had a place. Anything extraneous could be banished to a single junk drawer and I purged it every year. But now my husband and I are working parents and it's really hard to stay as organized as before. We found ourselves accumulating piles of stuff. As soon as we cleaned it off by putting it somewhere we'd accumulate a new pile of stuff. Same story with kid toys. We made a shelf for the toys so certain toys went in certain shelves. But it just ended up with toys getting stuffed into any shelf that had space. It was clearly working only 50%. So, right now I have 2 big projects: 1) build a family command center and 2) give the kids their own room. They are both coming along slowly, but at least I've started on both. 1. A mail collection box. You can't see it but mail gets dropped through a slot in our door. My husband and I used to pile the mail in places all along the route to the kitchen as well as the kitchen counter. We'd have piles on a toy cabinet, the piano, the dining table, the breakfast bar, and finally the kitchen counter. 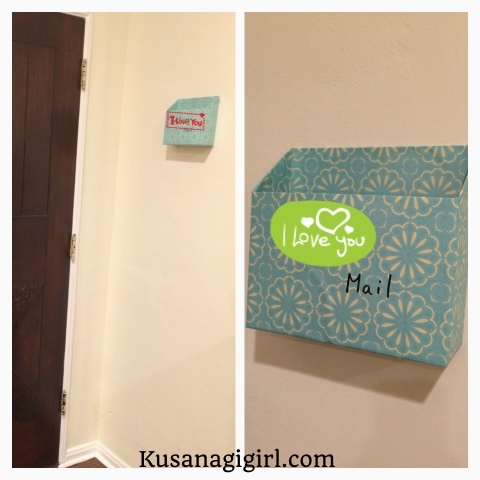 Now, with this DIY mail box (cereal box, adhesive design paper, 3M Command strips) we have a consolidated place for mail that we can check every few days. Eventually, I will make a couple more boxes for the mail we get for my in-laws and parents. 2. A dedicated place for the shredder. 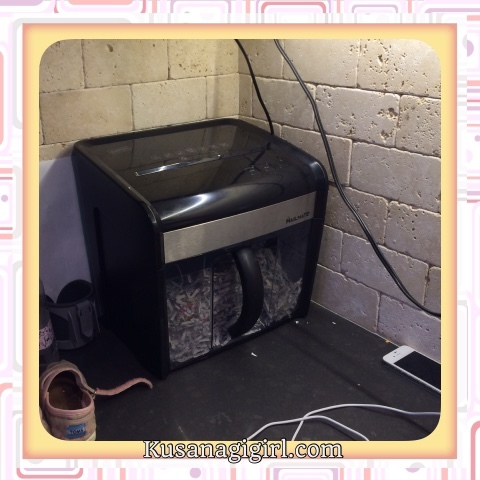 My husband used to have to move the shredder out of a closet every time he wanted to use it. This was a contributing factor to the piles because it was such a chore to get it from the closet, make space for it, and clean it before returning it to the closet. Now that it's on our laundry counter (which is in the kitchen) it's really easy to plug in and it's right next to the recycling bin. Most importantly, it's out of reach of the kids. Shredding junk mail has never been easier and we've been successful at keeping piles of mail down. 3. 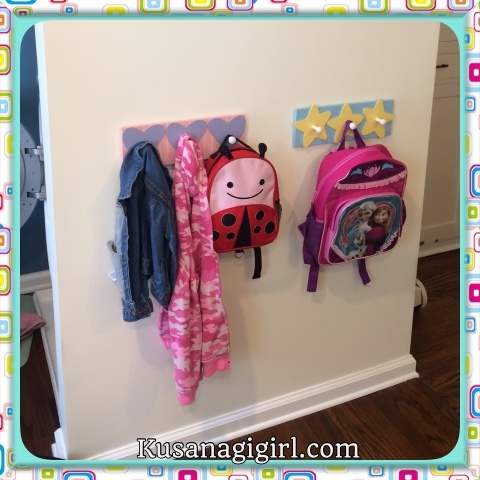 A landing spot for before and after school jackets and backpacks. I placed this against our laundry wall right next to the door where the girls and I go out and come in from the outside. Since my toddler is toilet training right now, this is the PERFECT place for her backpack. All her wet clothes can go straight into the wash after we get in. For my infant, this is the PERFECT place for her bag because I can get her formula, bottles and pacifier from the dishwasher 2 steps away and diapers and wipes from an under counter cabinet also 2 steps away. I attached the pegs to the wall with 3M Command strips, a godsend! It's not perfect yet but we're getting there! In all of this, it's been important for my husband and I to suffer - nay - pay homage to our lifestyle, our organization styles, the layout of our house, and our morning and evening routines to make our home as functional as possible. I hope this little tip has helped some of you and stay tuned for more because this is definitely a work in progress.